Engineered at Reel To Reel. B2 samples Dickie Goodman "Mr. Jaws"
Reissued in 1995 with slightly different center labels and Bootlegged in 2009 with identical label artwork but different run-out grooves. Vinnie devine mixed the tracks laurent x was an artist not a group. From the joyous, immediate and arresting start, Machines does not let go of you. Its relentless need and seemingly automaton-like drive is echoed in UR productions, whilst possibly cocking an ear to the intermittent interjections of DAF? Pure genius. What is contained in a few short minutes, countless acid-referencing artists span out and eventually bored us with, unsure of where to proceed with the goods they had been entrusted. From the underground beauty to a level of a great Acid House standard, "Machines" puts together those amazing elements necessary to be a timeless tune. Made by Mark Imperial & Vinnie Devine as Laurent X, "Machines" was conceived in a 16 track studio with an unquestionable Roland TB-303, but also a TR-808, TR-909, a Juno 106, some FX and a bucket of rib tips. According to Mark Imperial, he and his friends (specially Vinnie Devine) had a mad fun playing with gear. "I was DJing Italo imports since 1980, and as a regular on the Chicago DJ scene, naturally I became involved in DJ International Records from the beginning", says Mark about how the whole thing started. It was what we call a 'thinktank', and these young producers all experimented with gear. Mark Imperial's exposure to the acid sounds of TB-303 came from his dear friend Adonis (the one responsible for "No Way Back"), and Mark's exposure to the Juno 106 from Dane Roewade. About the equipment he made use at that time, Mark also stated: "I visited Detroit and was exposed to the Yamaha DX-100, a mere toy that was a staple to the Detroit sound at the time" (Derrick May, for example, did several of his early tunes' basslines with it, and Kenny Larkin confessed it was the equipment through which he made the etheral pianos of 'Yennek - Serena X' classic). Mark Imperial continued: "Although I didn't visit Detroit until 1989, Derrick May showed admiration for my track "Jason's Revenge" which I did in 1986", a fact that made Mark believe he was making "Techno" at its very early days. Has there ever been any acid that's topped the title track of this EP? A squelchy acid line that'll take you right out to the far side of space. Some great Star Trek like bleeps and the hypnotic vox add to the greatness. I don't think this is beatable. The other tracks are on the deep house tip and nowhere near as immediate. A true 303 classic that deserves its place in house and techno history. What a record!! 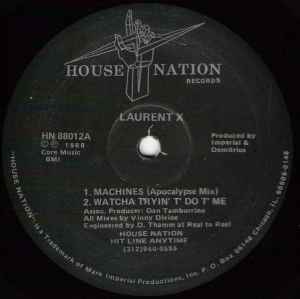 Laurent X's "Machines" is one of the real gems to come out of Chicago, a frequently overlooked acid house masterpiece which has more than a passing resemblance to alot of the early nineties 'bleep' techno/house which it influenced. Mark Imperial (and Vinny Devine) should really get more credit for innovating the Chicago sound through some great releases such "J'Adore Danser", "The Love I Lost", and The Children's "Freedom". With "Machines" they have created one of the most memorable acid lines ever - a really wild warehouse track underpinned by tough beats, and some great robot-like vox. "12am and "Drowning in a Sea of House" are great slices of old school deep house, but it is the title cut that will devastate. Do not be without it!